Pblrep is a blue-light repressible promoter that will only allow RNAP to transcribe genes downstream in the absence of blue-light (465) exposure (Dark condition). Under blue-light, EL222 will constitutively repress transcription by binding to its DNA binding region within this promoter, causing steric hindrance to RNAP binding. Since light can be controlled easily in space, time and degree, this new basic part will enable tight spatiotemporal control of gene expression. Pblrep is a blue light repressible promoter. This part requires cells to also express EL222 (BBa_K2332004), a natural photosensitive DNA-binding protein that becomes active only upon blue-light exposure. This part consists of the 18bp DNA binding region of EL222, a natural photosensitive DNA-binding protein from the marine bacterium Erythrobacter litoralis HTCC2594, positioned between the -35 and -10 regions of the RNAP binding site. In the dark, EL222 is inactive as its N-terminal LOV domain represses its DNA-binding C-terminal HTH domain. In the daytime, exposure to blue light (450nm) results in the LOV-HTH interaction to be released, allowing it to dimerize and bind its binding region, causing steric hindrance to RNAP binding, ultimately repressing transcription. Figure 1: Blue light repression system. Pblrep-LuxCDABE construct is shown on the left. Under blue light, the EL222 DNA binding protein dimerises and binds its binding region within the designed Pblind promoter, positioned between the -35 and -10 regions of the RNAP binding site, causing steric hindrance to RNAP binding, ultimately repressing transcription of LuxCDABE. Figure adapted from Jayaraman P. et al. (2016). 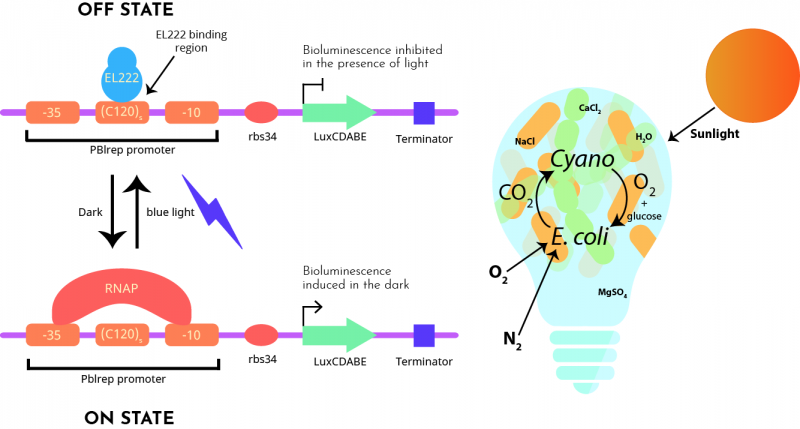 On the right, there is a representation of our bacteria powered light bulb consisting of E. coli cells expressing this construct and EL222 construct, co-cultured with Synechococcus elongatus PCC 7942 expressing heterologous sucrose transporters.